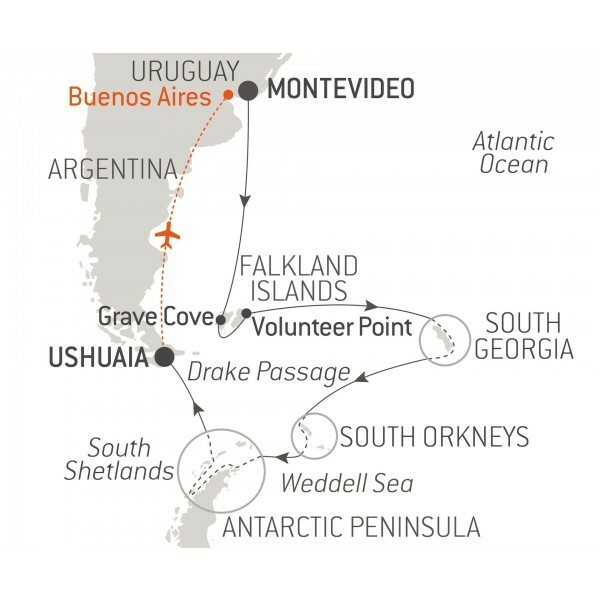 Join an extraordinary 21-day adventure in the Antarctic. 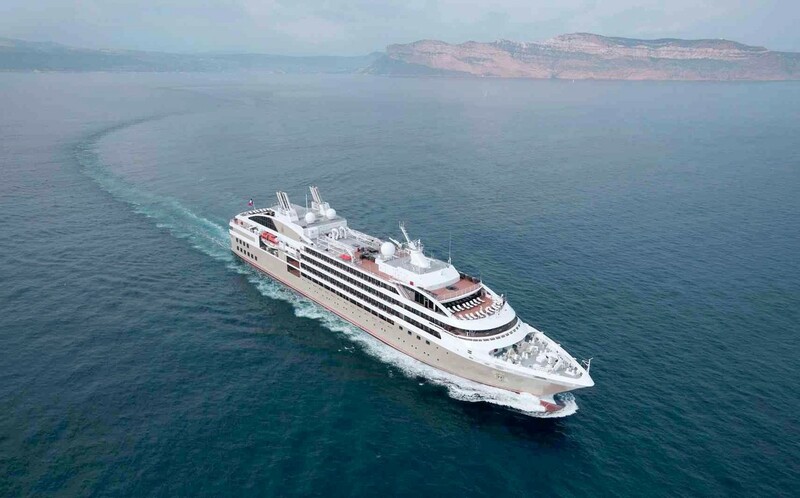 You will board Le Lyrial for an all-new polar expedition cruise with an extremely rich itinerary that will take you from Montevideo to Ushuaia. 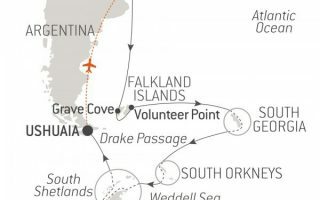 • The most comprehensive of our cruises to the Antarctic: the Falkland Islands, South Georgia, the South Orkney Islands, and the Antarctic Peninsula. • Discovery of the South Orkney Islands. • Landscapes: moors scattered with moss and lichen, white-sand beaches and turquoise waters in the Falkland Islands; alpine landscapes, lush green plains and suspended glaciers in South Georgia; glaciers and snow-capped mountains in the South Orkney Islands; drifting icebergs, ice floe, glaciers and snow-capped mountains in the Antarctic Peninsula. • Wildlife: black-browed albatrosses, snowy albatrosses, Magellanic penguins, Gentoo penguins and southern rockhopper penguins in the Falkland Islands; king penguins, elephant seals, fur seals and macaroni penguins in South Georgia; humpback whales, Gentoo penguins, Adelie penguins, chinstrap penguins, leopard seals, crabeater seals and Weddell seals in the Antarctic Peninsula; leopard seals, chinstrap penguins, Adelie penguins and Gentoo penguins in the South Orkney Islands. Make your way through the turbulent Woolly Gut strait and emerge in the stillness of Grave Cove. Located in the northern edge of the Falkland Islands, this bay owes its name to the vestiges of whalers’ graves that overlook the beach. As you step off the boat and onto the white-sand beach, you might find yourself escorted by a few hospitable Commerson's dolphins, elegantly adorned in black and white. A stroll along the grassy dunes will lead you to a vast plain of lush green grass, tended by a few sheep. On the other side of the island you'll find one of the largest gentoo penguin colonies in the area. With some luck, you'll also glimpse a sea lion scouring the waves for his next meal.The Neck is a narrow stretch of land connecting the two sides of Saunders Island, located on the north-western edge of the Falklands. You'll safely enter these blustery surroundings with the assistance of your naturalist guides. And once there, a reward awaits you: a veritable paradise of endless shoreline lapped by turquoise waters. Several bird species, also attracted to this stunning location, have settled here. At the other end of The Neck, you'll encounter Magellanic penguins, southern rockhopper penguins, black-browed albatross and king penguins, all basking in the beauty of their surroundings. More than 85% glaciated, these remote mountainous islands are hidden in the Southern Ocean, some 600 km from the tip of the Antarctic Peninsula. The archipelago is composed of four main islands: Coronation Island, Signy Island, Powell Island and Laurie Island. Discovered in 1821 by seal hunters, they were also explored in 1823 by the British navigator James Weddel, who gave them their current name. Despite the ravages caused by whale and seal hunting, today a sizeable leopard seal population can be found there, along with chinstrap penguins and snow petrels. Laurie Island is home to an old scientific station that is still in operation. Succumb to the magic of a place unlike any other. To this day, the mythical Antarctic Peninsula still holds real fascination and promises its visitors unforgettable moments. Throughout your adventure in this icy realm, you will find yourself in the heart of a spectacular decor in subtle shades of blue and white, surrounded by exceptional wildlife. Penguins, humpback whales, seals and giant petrels are at home here, as are elephant seals, fur seals, Antarctic minke whales, and orcas. Depending on which sites you will be lucky enough to visit, you may get the chance to observe them and share with them the beauty of these extreme parts.Each day, based on ice conditions, the Captain and the Expedition Leader will suggest Zodiac® outings or landings to discover the infinite riches of the Antarctic Peninsula. Glaciers, ice floe, tabletop icebergs, mountain peaks that plunge straight into the sea, volcanic beaches, research stations, enchanting bays, and vestiges of the whaling industry: these are the faces of the Antarctic that will likely reveal themselves to you, in a hushed and surreal atmosphere. You will sail in the wake of Jean-Baptiste Charcot, Adrien de Gerlache and Sir Ernest Shackleton, great Antarctic explorers who, from the 19th century, set out to conquer these remote and uninhabited lands.